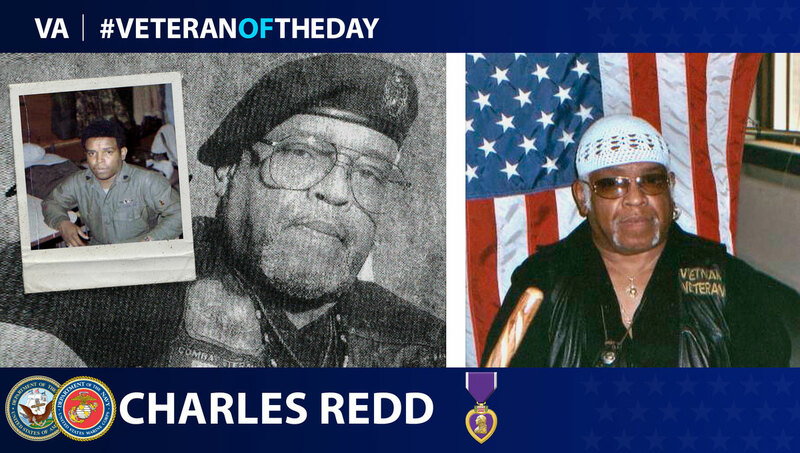 Today’s #VeteranOfTheDay is Navy and Marine Corps Veteran Charles W. Redd Jr. Charles served during the Cuban Missile Crisis, the Dominican Civil War and the Vietnam War. In 1960, after leaving high school, Charles enlisted with the Navy. After completing his training, Charles was assigned to the Essex-class aircraft carrier, USS Wasp. On Oct. 22, 1962, Charles and his fellow sailors were involved in the naval blockade of Cuba during the Cuban Missile Crisis. Upon the completion of his enlistment, Charles was discharged at the rank of seaman. After serving with the Navy, Charles reenlisted with the Marine Corps and was assigned to the 2nd Reconnaissance Battalion. In 1965, Charles, along with parts of 2nd Reconnaissance Battalion, were sent to the Dominican Republic to prevent communist paramilitaries from taking control of the country following the assassination of dictator Rafael Trujillo. While there, Charles and his fellow Marines were caught in an ambush while moving through a town. During their escape, Charles was struck and wounded in his leg. For this, Charles received the Purple Heart. After returning from the Dominican Republic, Charles volunteered for two tours in Vietnam. There, he was assigned to the 3rd Reconnaissance Battalion and participated in infantry patrols. During his time in Vietnam, Charles engaged in heavy combat with the enemy on multiple occasions. Charles was discharged from the Marine Corps in 1975 at the rank of sergeant. After leaving the Marine Corps, Charles returned to South Carolina for several years, until moving to Ohio, where he worked for the City of Dayton. Thank you for your service, Charles!